Indiana Landmarks will present Historic Madison, Inc., with the Cook Cup for Outstanding Restoration on April 27. Completed in 1849 as a private residence and transformed into an event venue beginning in 2011, the Shrewsbury-Windle House in Madison has won Indiana Landmarks’ 2019 Cook Cup for Outstanding Restoration. Indiana Landmarks, a private nonprofit organization that saves historic places, will present the award to the home’s owner, Historic Madison, Inc., at its annual Rescue Party on April 27 in Indianapolis. Located at 301 W. First St. in Madison’s National Historic Landmark district, the Shrewsbury-Windle House is considered by many experts to be the finest example of Greek Revival domestic interior design in the United States. The home features floor-to-ceiling windows with views of the Ohio River, and a spiral staircase ascending through the center of the home – an engineering marvel in itself. Charles Shrewsbury, who had the home built, entertained frequently, often hosting celebrities and dignitaries who were visiting Madison. The Shrewsbury-Windle House’s legacy as a venue for gatherings inspired the preservation organization Historic Madison, Inc., to turn it into an event venue beginning in 2011. It had been a private residence prior to its transformation. John and Ann Windle, who bought the home in 1948, were a driving force for historic preservation, founding Historic Madison in their home in 1960 and convincing locals and visitors that the city’s architecture was its key economic asset. 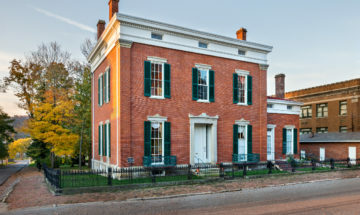 Upon Ann’s death in 2009, Historic Madison inherited the home, which is designated a National Historic Landmark, the highest historic designation a building can attain in the U.S. The house retained many of its original, character-defining features, including the stunning spiral staircase and original gasoliers—even paint from the 1850s on the drawing room walls. However, a leaky roof and deferred maintenance had taken a toll. Only a portion of the house was heated, and air conditioning had never been installed—factors that limited the property’s public use. Historic Madison raised $2.2 million for the Shrewsbury-Windle House restoration, which included repairing the roof and chimneys, updating the 1920s and 1950s mechanical, electric, and plumbing systems, and installing air conditioning, additional restrooms, and a sympathetic ramp to make the first floor accessible. Engineers faced a bigger challenge in figuring out how to add modern mechanical and lighting systems without marring the home’s historic appearance. Heating and cooling units went into the basement and attic, with lines running through the back of closets and a non-working chimney. Electricians restored the original gas light fixtures, now fitted with LED lamps and an electronic control system since the home has no light switches. Renowned for its street upon street of mid-nineteenth-century homes and commercial buildings, Madison boasts one of the largest National Historic Landmark districts in the nation. John Staicer, Historic Madison, 812-701-1542, john@historicmadisoninc.com. Indiana Landmarks revitalizes communities, reconnects us to our heritage, and saves meaningful places. 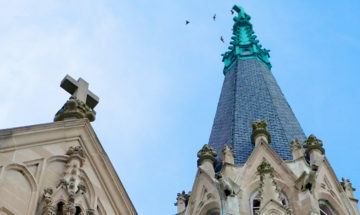 With nine offices located throughout the state, Indiana Landmarks helps people rescue endangered landmarks and restore historic neighborhoods and downtowns. People who join Indiana Landmarks receive its bimonthly magazine, Indiana Preservation. 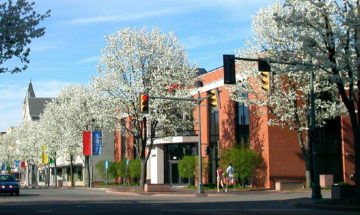 For more information on the not-for-profit organization, call 317-639-4534, 800-450-4534, or visit www.indianalandmarks.org.